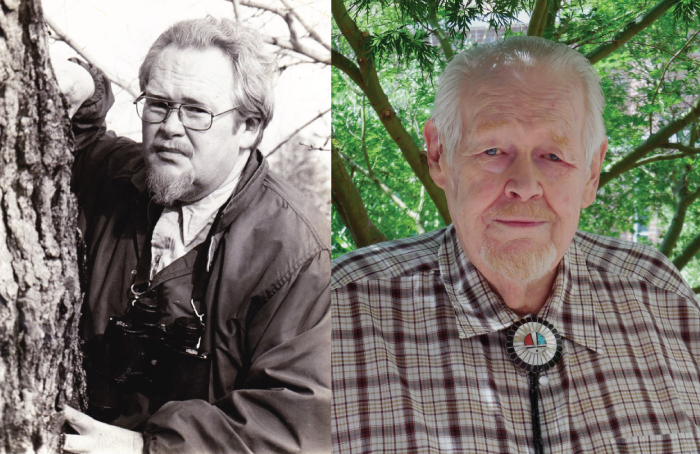 Chuck Roth, biology teacher, passionate naturalist, and nationally acclaimed as the “father of environmental literacy,” died in Concord, MA on February 21, 2016. A mover and shaker in the in the world of Conservation and Environmental Education, Chuck had earned a Master of Science degree from Cornell University and left Ithaca with a commitment to follow in the footsteps of Anna Botsford Comstock, E. Lawrence Palmer, and Joseph Wood Krutch. From 1960 to 1988 Chuck was Director of Education for the Massachusetts Audubon Society (M.A.S.) where he created programs for children and parents visiting Drumlin Farm, and for camp counselors and teachers across the state – programs designed to help participants engage with, and appreciate, the nature around them. He created a conservation education library second to none, conducted teacher training programs across New England, and made M.A.S. a hub for environmental education. In 1972 He headed up a team that created the Commonwealth’s first conservation education plan. Warm and outgoing, Chuck was never too busy to help others. Over the years, he worked with and mentored many of New England’s top environmental educators – often totally behind the scenes. He enjoyed bringing people together and some of the gatherings he initiated eventually became permanent organizations. This is how the New England Environmental Education Association (NEEEA) and MEES began. Health and family issues took Chuck from Massachusetts for a few years but in 2012 he returned, still passionate about the need for an environmentally literate citizenry. He never lost his commitment to this and even as he was failing, he provided advice to the team drafting the Massachusetts Environmental Literacy plan presented at the 2016 MEES meeting. In addition to his skills as a naturalist and an educator, Chuck was an author, an illustrator, a painter, and a master wood carver! If we have made advances in Environmental Education over the past 50 years, it is not because we saw further or were wiser than those who went before, it is, as Albert Einstein once said, because we stood on the shoulders of giants. Chuck Roth was one of those giants!